Our members have selected Connie Johnson as the gubernatorial candidate that OROK will endorse in the primary. An online poll was conducted from Dec. 16 through Jan 3. The results were Johnson, 68; Drew Edmondson, 25; None of the Above, 1. Of the 114 members eligible to vote, 94 participated, an 82 percent turnout! As previously decided by the board, the winner in this poll will be forwarded on to OR national for their consideration for endorsement. Congratulations to this progressive Oklahoma leader! Read more about our endorsement process. Our election was conducted using OpaVote, and managed by OROK member Rena Guay. To vote in our elections you must be an official member of OROK. You become “official” by making a donation to us of any amount, or by attending two official events, such as quarterly membership meetings. 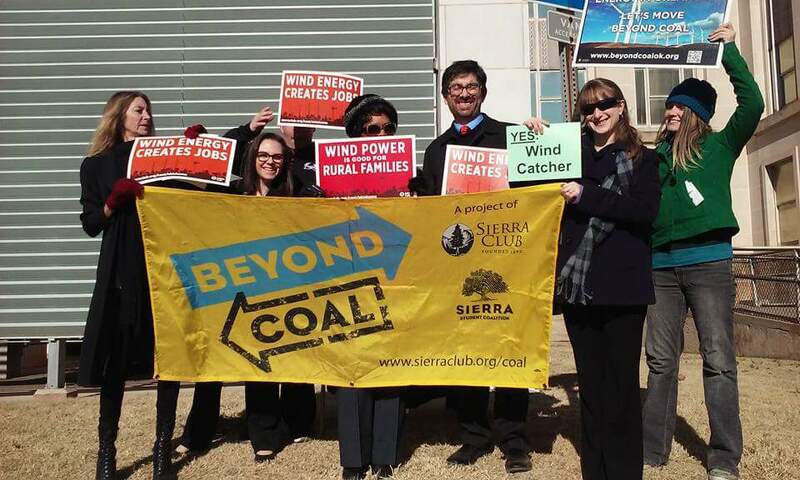 The Sierra Club did a fantastic job of gathering their troops and involving other organizations to attend. They provided talking points, rally signs and buttons. The best proponents I believe were three folks from Keys, OK (population 281) in Cimarron Co. — the school superintendent, the Mayor and a County Commissioner. They each described the economic conditions this rural community finds itself in. No major industries and so no tax base to draw from, no large employers, no grocery store, few goods and services. A reduction in the number of farms from 100 to a couple of dozen. 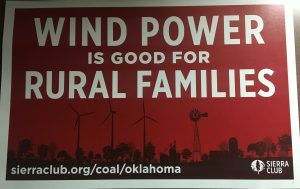 The school district is now the smallest in the state “classrooms of 30 formerly and now a total school population of 56.” The Wind Catcher project has given the community hope. Jobs, revenues, increased goods and services, a growing population, employment opportunities and therefore a reason for families to remain in the community. Other OROK members were also on hand, including Lynne Davis and Michelle Stearnes. We hope to hear good news soon regarding the OCC’s decision on this project. Michelle Stearnes, far left; Connie Johnson, center (with sunglasses).